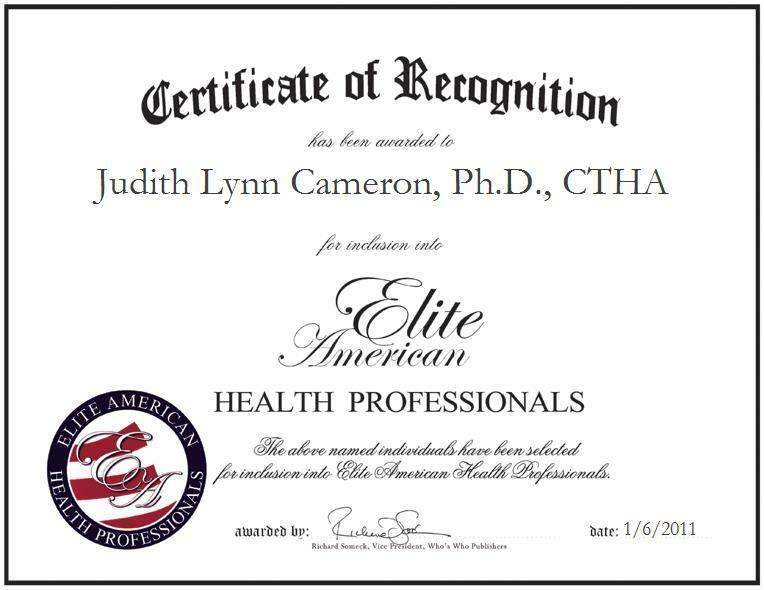 La Habra, California | January 6, 2011 | Judith Lynn Cameron, Ph.D., CTHA, owner, therapist, and instructor at Cosmic Angel Hypnotherapy and Healing, has been recognized by Elite American Health Professionals for demonstrating dedication, leadership and excellence in alternative medicine. As an expert in hypnotherapy and post-traumatic stress disorder treatments, Dr. Cameron treats individuals with stress and anxiety, assists patients with post-traumatic stress disorder, teaches classes through the International Hypnosis Federation, and works with high school students and teens with sports hypnosis test anxiety issues. As a kind, patient, understanding, caring and dedicated person, Dr. Cameron attributes her success to her drive, desire to learn, desire to help young people, and the support she receives from her husband. Dr. Cameron is a driving force in her industry and she believes her drive and willingness to learn new and unusual things, as well as an interest to take the path less travelled, separates her from her peers. Dr. Cameron intends to continue her progression through her field and begin to practice Reiki and spiritual hypnosis, as well as teach seminars and conduct national retreats. Prior to her current position, Dr. Cameron was a professor of psychology and healing arts at St. John’s University from 1994-2005, she was the owner of Four C Services, Inc. from 1980-1988, the owner of Camwal Enterprises, Inc. form 1978-1986, a teacher at Bonita Unified School District from 1968-2008, and a physical science teacher at Mt. San Antonio College. In 1985, Dr. Cameron applied for the position of California Teacher in Space for NASA’s program to send a teacher into space. After the Challenger’s accident seconds after liftoff, a California teacher dropped out of the running allowing Dr. Cameron to be chosen for the position. In 1994, on the 25th Anniversary of the Apollo 11 moon landing, Dr. Cameron was selected as one of the three American teachers to be present for a press conference in the East Room of the White House. At the Press Conference, Dr. Cameron met then President Bill Clinton, First Lady Hillary Rodham Clinton, Neil Armstrong, Michael Collins and Buzz Aldrin. Devoted to helping others, Dr. Cameron works with homeless people in the Los Angeles metropolitan area, she reads to children and the elderly at various southern California locations, and she is thankful to have been able to help improve others’ quality of life. Since the age of six, Dr. Cameron has encountered unusual experiences that she could not explain; she now studies hypnosis and parapsychology to enhance her understanding of the powers of the mind. She is amazed by the ways in which the mind works through hypnosis and meditation. In 2005, Dr. Cameron graduated from St. John’s University with a Doctor of Philosophy (Ph.D.) in parapsychology. She earned a Ph.D. in clinical hypnotherapy from the American Institute of Hypnotherapy in 1987, a Master of Science in elementary and special education from California State University in 1976, a Bachelor of Arts in psychology with a minor in general science and German in 1967, and an Associate of Arts in psychology from Sacramento City College. 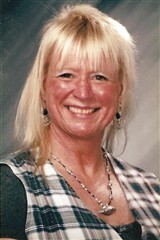 Dr. Cameron is a certified administrator with the state of California public schools, a certified teacher for special education and learning handicaps, she has a certification in Reiki II, a certification in hypnotic anesthesiology, a certification in medical hypnosis, a certification in thoracic outlet syndrome, and she is certified as a close encounter therapy practitioner and a spiritual counselor. For more information on Dr. Judith L. Cameron and Cosmic Angel Hypnotherapy, please visit http://www.cosmicangelhypnotherapy.com.